A daylong celebration of bar-b-que, beer, and George Jones!!! Tickets are $5 in advance, $7 at the door, $9 if under 21. Got a story to tell about George? Want to submit an album or concert review? Send it to us. We might just put it here! George Jones first hit the charts in the 1950's. In April 1999, he celebrated the 40th Anniversary of his first Number One record, "White Lightning." It was also the year that Jones won his second Grammy as Best Male Country Vocalist for his performance on the single "Choices." His only previous Grammy was in 1981 for his performance of "He Stopped Loving Her Today." Jones' Gold-selling 1999 COLD HARD TRUTH CD reminded fans and critics alike why he's considered "the greatest living country singer." "Choices," the first single from that album marked his 164th charted record. The Keith Stegall produced project earned Jones some of the best reviews of his already illustrious career and ensured his place in the new millennium of country music. Whether the times have favored honky tonk songs or lushly produced "pop" offerings, George Jones has continued to make his brand of country music, which has produced hits in every decade of the second half of the 20th century. In fact, Jones has had more charted singles than any other artist in any format in the history of popular music. In 2000 Jones' label, Asylum Records was consolidated into Warner Bros. Records, effectively closing the legendary imprint. Without Asylum's management team of Evelyn Shriver and Susan Nadler at the helm, Jones opted to leave Warner Bros. Records. In 2001 Shriver and Nadler formed Bandit Records. Not only was Jones the first artist signed to the label, he became a principal partner in the venture. Bandit then formed a joint venture with BMG's BNA label for sales, marketing and promotion services. GEORGE JONES' THE ROCK is the first release under the BNA/Bandit banner. THE ROCK was recorded in two phases: the first group of songs were produced in 2000 by Emory Gordy, Jr. including the first single, "The Man He Was" written by Harley Allen and John Wiggins. The second stage was recorded in July 2001 and was produced by Keith Stegall. A pivotal song on the album is the emotion-wrenching "50,000 Names," written by Jamie O'Hara who had also contributed the title tune to "Cold Hard Truth." The song speaks of the heartache and destruction experienced by so many as symbolized by the Vietnam Wall. In 1998, while in the middle of recording "Cold Hard Truth," Jones had a horrific car accident when he lost control of his SUV and hit a bridge just a mile from his home. It took two houses for emergency medical teams to free him from the car. Doctors feared the worst as Jones had a collapsed lung, torn liver and other internal injuries. Jones remained in critical care on a ventilator to help him breathe for eleven days. He then developed pneumonia which further exasperated his recovery. The situation looked bleak. Performers from all eras-Little Jimmy Dickens, Alan Jackson, Randy Travis, George Strait, Sammy Kershaw, and Billy Ray Cyrus, as well as Jones' famed retired producer and friend Billy Sherrill, came to lend their support to Jones' family. After recovering for several months, Jones resumed his career with the release of "Cold Hard Truth" and his never-ending touring schedule. Butthis was a new George Jones who had finally turned his life around. Not only did he give up liquor, he stopped smoking and drinking coffee. "That accident put the fear of God into me," said Jones. "I realized I was getting to the age that I had to quit all that mess and smoking was hurting my lungs and affecting my voice. So I just quit it all. Within months I was hitting higher notes than I ever hit before and wishing I had done it years ago." George Glenn Jones was born in Saratoga in East Texas. As a kid, he sang for tips on the streets of nearby Beaumont. By age 24, he had been married twice, served in the Marines and was a veteran of the Texas honky tonk circuit. On a recording session in 1955 for Starday Records, producer Pappy Dailey suggested he quit singing like his idols, Lefty Frizell, Roy Acuff and Hank Williams, and try singing like George Jones. The result was "Why Baby Why," his first Top Five hit. At Starday, Jones made rockabilly records as Thumper Jones and had his first #1 at Mercury Records in 1959 with "White Lightning." In 1961, he hit #1 again with "Tender Years" and "She Thinks I Still Care," which held the #1 spot for six weeks and led to Male Vocalist of the Year awards from the Country Music Association in 1962 and again in 1963. Later in the '60s on the Musicor label, his singles consistently hit the Top 10 and he hit #1 again in 1967 with "Walk Through This World With Me." Jones, the top male singer in country music, married country music's hottest new female artist Tammy Wynette in 1969. He soon joined Wynette's label, Epic, where he enjoyed a successful 20-year association with producer Billy Sherrill. He hit #1 in the '70s with "The Grand Tour" and "The Door," both in 1974. His marriage to Wynette was stormy, but in the recording studio they were the perfect duet partners, hitting #1 with "We're Gonna Hold On" in 1974 and, coinciding with their 1976 divorce, "Golden Ring" and "Near You." Jones kicked off the 1980's with one of the all-time great country records, "He Stopped Loving Her Today," which won him Single of the Year honors from the CMA in 1980 and again in 1981. He won virtually every award available for that song including the Grammy. The song remained #1 for 18 weeks. His hits continued throughout the decade and his video for "Who's Gonna Fill Their Shoes" won the CMA's Video of the Year ward in 1986. In 1991, Jones signed with MCA Records, an event MCA Nashville President said was "like signing Elvis." In 1992, the CMA recognized Jones' monumental career by inducting him into the Country Music Hall of Fame. He recorded "High-Tech Redneck" and the highly acclaimed acoustic album "The Bradley Barn Sessions" for MCA. In 1995, Jones and Tammy Wynette were reunited for a new CD entitled "One" and toured together for the first time in twenty years. Thankfully, George and Tammy had found friendship and peace in their relationship before the First Lady of Country Music unexpectedly passed away in 1998. In 1996, Jones told his life story in the book I LIVED TO TELL IT ALL, which went to #6 on The New York Times bestsellers list. As country fans were reading about his infamous past, he drew from his musical past in putting together his last CD for MCA also entitled "I Lived To Tell It All." His COLD HARD TRUTH project proved that George Jones is still "hotter than a $2.00 pistol" and is poised to continue his amazing musical legacy with the BNA/Bandit release, THE ROCK. When shopping for George Jones Music, Pictures, etc. keep Amazon.com in mind. They are easy to navagate and have thousands of George Jones items. Use the Amazon.com George Jones page to find more. CountryPolitan.com offers a great selection of news on your country favorites from yesterday and today. 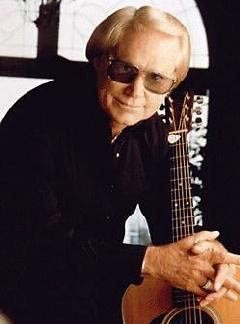 Check out the George Jones Bio by clicking here. Got a country music website? Add it here! Looking for books about George Jones? Amazon.com carries them all. Including I Lived To Tell It All...Just$6.99! Article Credited to USA Today. NASHVILLE - By his own account, George Jones, the preternaturally gifted country singer, should not have survived. But here he is, grinning and gabbing in his mansion on a hill overlooking ponds stocked with catfish, white perch and bass. But in the late '70s, this country legend was an addled, rail-thin cocaine addict. He often was seen around Nashville sitting in his car, arguing with himself in the voices of Donald Duck and a character he called the Old Man. But with the help of (what else) a Good Woman and the Good Lord, he climbed back to reclaim his country throne and to tell the tale in I Lived to Tell It All (Villard, $23). "I wanted to set the record straight, instead of all this hearsay that's been wrote," he says. Actually, the stories he tells on himself exceed even those on the country-music grapevine. The impoverished boy who began his career singing on the streets of Beaumont, Texas, grew into a life of gunplay and violence. At one point, he says, he was controlled by mobsters who forced cocaine up his nose and taped him, mummy-like, from knees to armpits so he couldn't collapse onstage and they could collect his fee. Not to mention the time he was beaten by a husband who caught him in bed with the man's striptease-dancer wife; his days as a murder suspect; and, of course, his tempestuous marriage to Tammy Wynette, a relationship that remains, as their song said, a "two-story house." While Wynette sticks to her story that a drunken, gun-happy Jones shot up their home and tried to shoot her, Jones says it never happened and seems to relish further shattering the myth of country's most romanticized - and doomed - union. "All women love security, but she really went overboard," he says of country's first lady. "I honestly think that was one of the main reasons she married me." The trouble began, he says, when Wynette's Stand by Your Man became an international hit. "I think in her mind she calculated the fact that she didn't need me for security any longer." But didn't they love each other? "I reckon," he mutters. It was after the divorce that he hit the lowest point, he says; unable to go onstage, he was convinced to try cocaine. "I even knew of people that were on it, like my good friend Waylon (Jennings), who I was even trying to help from time to time. I tried it and it perked me up. They said I went onstage and did the best show I'd ever done, which I don't believe." Jones, 64, credits his fourth and current wife, the former Nancy Sepulvado, with turning him around. They married in 1983. "If I'd given up he'd be dead," says the energetic Nancy, whose two daughters have homes on the Jones "compound," along with Jones' oldest child, Susan. Nancy says she never thought of herself as a "rescuer" before she met Jones. "It was just fighting for the one you love, I guess. That's the only way I could put it." And what she put up with. The drug pushers who had taken control of Jones when he lived in Alabama tried to kill her and her daughter, and her major ally, a character named "Big Daddy," was found decapitated. And then there was Jones, who'd throw her off his bus, leaving her stranded without money unless his road manager could throw a $100 bill out the window before the bus pulled away. There also was a beating or two and the godawful ranting of the duck and the old guy. Crazily, some would say, she stuck with him. "There's a lot of things I did wrong that I would like to have changed," Jones says. "I sit here today and wonder how in the hell I ever really got through all that mess and didn't get arrested more than I was, or got killed some way." He apologizes to fans who so often were disappointed by "No-Show Jones." But many dates, he says, were booked by his hoodlum-handlers, who collected advance money for shows that never happened. "I know I missed a lot of dates on my own, but I wouldn't be scared to say that two-thirds of the dates I missed I didn't even know about." And it was Jones, of course, who was sued for the no-shows, which ultimately led to bankruptcy. But the more anguish the singer experienced in his personal life, the more his career flourished, partly because fans were enthralled by the confessional nature of such early '80s hits as Still Doin' Time, about living in a "cage" of taverns, and If Drinkin' Don't Kill Me (Her Memory Will), in which he often changed the lyric to "Tammy's memory will." Jones has his own take on the mysterious 1978 abduction of Wynette, who told police she was grabbed at a Nashville shopping center by a masked man and beaten and thrown from her vehicle. Jones says it was a "hoax," and though the gossip mill said he was involved, he was in Alabama at the time and was never questioned by police. He also cites other sources who say his crooked managers may have abducted Wynette to frighten her and keep her from trying to collect more divorce-settlement funds that would otherwise go into their pockets. Jones admits the book may disappoint some fans because there's limited information about recording sessions and songs. That's partly because he was often drunk and because he's recorded hundreds and hundreds of songs and the process has become a blur. What he wishes he had forgotten was an early, brief rock career as "Thumper" Jones. "One time I tried to buy all the masters and burn them." The book does have considerable information on Jones' turnaround 1980 hit, He Stopped Loving Her Today, which he rewrote hundreds of times and carried around for a year before taking it into the studio. Another 18 months were spent trying to complete the recording because Jones slurred spoken words when he drank, and producer Billy Sherrill had to catch him sober enough to utter the song's four spoken lines. The enormous hit made Jones a $25,000-a-night star, plus percentages, huge money for a country star at the time. A four-decade career had been salvaged by a three-minute song, Jones writes. There is a God. The song remains the biggest hit for the honky-tonk baroque stylist whose vocal hiccups, moans and bottomless rumbles convey both deep emotion and elegance. It's a magic that works equally well on such disparate Jones classics as the backwoods White Lightning and the weeping She Thinks I Still Care. "A lot of people always said I could make five syllables out of one, and that's the phrasing I got from Lefty Frizzell," Jones says. "I got that part from him, and overall I got my style from Roy Acuff." The Jones style also has made him a singer's singer. When Johnny Cash is asked to name his favorite country artist, his stock reply is, "You mean besides George Jones?" Jones still plays about 120 dates a year, often touring in his leased Learjet, a far cry from the old days when it once got so hot in his bus that he ventilated it with bullet holes. On his next album, 100 Proof Memories (due in July), he's revisiting the hardscrabble days by "doin' the old George Jones-type stuff," including the drinking songs frowned on by contemporary country. "A lot of people still like to hear them. And though I don't booze it down no more, I still love to sing 'em." 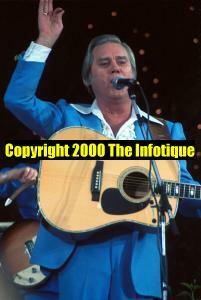 Got a George Jones story or encounter...Contact Us, We may even add it to this page!